Home > Israel, Middle East	> What’s Different About the New Israeli Peace Initiative? (1) The so-called “Arab Peace Initiative” was a desperation move made by Saudi Arabia after 9/11 to take some of the heat off of them because many people in the world were blaming their Salafist/Wahabist extremist form of Islam for generating the terrorists who carried it out. It was never meant to be a serious “peace proposal”, it was merely a PR ploy made for political reasons, no more. No serious attempt was made to sell the plan. One time, a few years ago, they took out ads in the Israeli newspapers pushing it, but the terms were clearly unacceptable, particularly their insistence on the so-called “Right of Return” of the Palestinian refugees. (2) This IPI offers less to the Palestinians than did Olmert’s plan. Olmert was willing to give up the Western Wall, Mt of Olives and Jewish Quarter of the Old City of Jerudsalem to an “International body” (meaning Palestinian control-with a fig-leaf cover of “multinationalism”). If Olmert’s plan was unacceptable, why should the Palestinians accept this? (3) If the supposed “diplomatic tsunami” of UN recogniation of a Palestinian state within the pre-67 borders is coming, why should the Palestinians even waste their time negotiating with Israel who will offer them less? (4) If the General pushing the IPI think such an agreement is “vital for Israel’s interests”, why should the Palestinians agree to it? Olmert and Livni are also saying this all the time. Can you imagine Abbas and Fayayd saying “we had better hurry up and accept Israel’s offer so we can help them”? If the Palestinians view having no agreement as bad for Israel’s interests, that is what they will want, and indeed, this is the situation. (5) The elephant in the room that no one wants to mention is the “right of return” of the Palestinians refugees. The proposal of the IPI to have the refugees return only to the Palestinian state is ABSOLUTELY OUT OF THE QUESTION for the Palestinians. 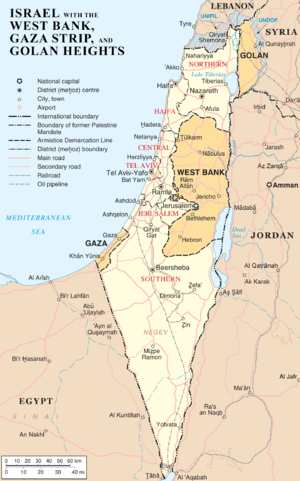 Having a million or million and half refugees, loaded with reparations money, coming into the small, claustrophic West Bank territory where there is no room for them would certainly cause a civil war. The refugees and the Palestinians living in the West Bank have nothing in common, they are different peoples and those on the West Bank would immensely resent these newcomers who would use their money to push the veterans out. The civil war this would bing would be of the same nature as the civil war that exists between FATAH in the West Bank and HAMAS of Gaza. Thus, this proposal of the IPI is a complete non-starter. Of course, veterans of the Israeli “peace camp” have always attempted to ignore the refugee question, viewing it merely as a negotiating card, to be used to get something big out of the Israeli. In reality, it is the CORE of the Arab/Israeli conflict. It is NOT a conflict over territory, it is a conflict over the very existence of Israel and the demand for the right of return is the weapon the Palestinians intend to use for the ultimate eradication of Israel, which is the goal of the Arabs. Ultimately, the Arab-Israeli conflict IS A ZERO-SUM GAME because that is how the Arabs define it. Only when that changes will there be a real chance for peace, but not before.